Southern California Edison (SCE) changed the electricity costs for most commercial customers, reducing their overall costs by around 8 to 10%. This is a positive change but not for current and future commercial solar customers in SCE territory. There are two main components in the costs of energy, one is the cost for the volume of energy consumed known as energy charges (kWh), and the second is the cost for the highest amount of energy delivered over a certain time period, otherwise known as demand charges (kW). 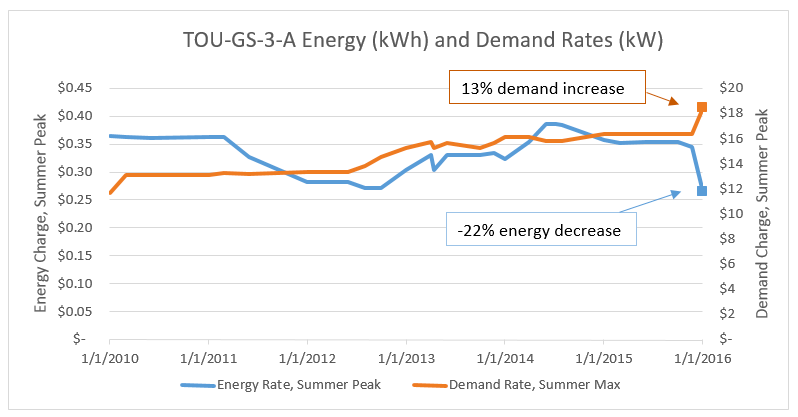 Since 2010, SCE rates for both energy and demand have been relatively steady, reflecting a low level of underlying inflation and low fuel prices. However, with natural gas prices down 30% since 2014, SCE could lower the cost of power to their customers. What is important for SCE’s solar customers is how SCE went about lowering the cost of electricity. Instead of simply lowering energy and demand costs by 8%, SCE reduced energy charges by 22% and increased the demand charges by 13%. This change, essentially restructuring how SCE charges customers for energy, was applied across the board, including to the solar friendly “Option R” tariffs. For solar customers, this change reduced the overall value of solar generated energy (the avoided cost) by 15% annually, compared to utility sourced electricity. For some customers the impact may be large enough to make an existing solar installation or planned solar project financially unattractive. The main reasoning behind SCE’s rate restructuring is that SCE and the CPUC are interested in incenting customers to reduce their peak demand, which is relatively expensive for the utility to provide. Why this change was applied across the board to the Option R tariff was not disclosed, nor has the California Public Utilities Commission (CPUC), which must approval all tariff changes, made any comment on the change. This change negatively affects SCE commercial customers whose electrical bills are being offset by solar, whether the project exports energy or not. Some customers who have PPA, bond or lease financed projects may be at risk of paying more for energy than they would if they did not have a PV system and were purchasing all electricity from SCE. What does this mean for your solar project? Approximately 15% of the future value of solar projects is lost due to this change. Even if SCE energy rates rise back to long term averages, the loss in solar value will remain if the rate restructuring remains in place. For a typical large commercial project with an IRR of 10%-15%, the IRR will be reduced to 8%-10%. For smaller or costlier projects, potential savings could be wiped out. The first item is to change lighting to new LED lighting. Using a commercial lighting company is important as they will understand your needs and provide you with the best options at an affordable price. 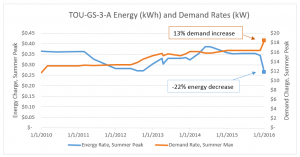 Lowering the overall demand for electricity is imperative to reducing demand charges. Lighting will typically account for 30% of the overall electricity bill. By retrofitting existing fixtures and installing LED lights the average reduction of energy use is over 50% thus lowering the overall demand by 15%. This is the most effective and efficient use of funds and generally the LED lighting retrofit pays for itself in about a year through energy, maintenance and HVAC savings. The second for solar depends on what stage of a solar project you have reached. If you are currently in the planning stages of a solar project, you should update your financial models to take into account this loss of value. If you already have a signed contract or installed system, you will need to revise your expected returns. Portions of this article are excerpts from Sage Renewables’ author Tom Williard whom has researched and written an in-depth white paper discussing the SCE rate change and the impacts for solar projects.